In case of Process Chain that contains BPC related processes by default it doesn’t run a synchronously. Means if there are any parallel flows in the PC they just run one by one. Next one just starts when previous one is finished. This may look strange on first time as one would expect that parallel flow simply runs in parallel (asynchronously). But it has an explanation. As per below SAP Notes if PC triggered by BPC process chain '/CPMB/TRIGGER_BW_CHAIN' then no message is not sent out and whole PC is executed in synchronous mode. The BPC processes that can be involved in such a PC can be anything that is dealing with objects using namespace '/CPMB/’. To fix this and be able to run also the PCs with the BPC processes asynchronously below 1st Note must be implemented and parameter called 'TRIGGER_BW_CHAIN_ASYNC' must be set to X in BPC customizing. With the regards to BW transports situation is not very easy for BW developers. Once you add objects that were edited or newly created into the transport it is not very easy to find out what objects are really in the transport. This is caused by fact that normally BW objects (e.g. query elements, TRFNs, DTPs, Ipacks, etc.) are represented in the transport by it technical ID which is not always possible to be read by humans. Some of the BW developers came up with custom tool that basically associates BW technical ID with their descriptions to enable easier navigation with the transports. 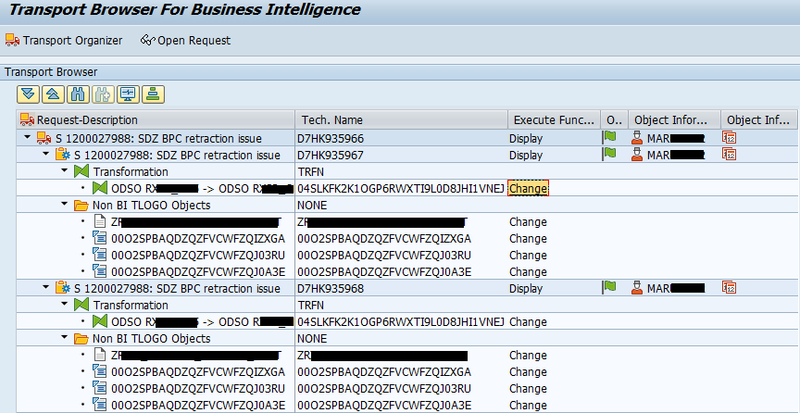 However as of BW version 7.x there is a new SAP standard t-code that support BW transports. It is RS09 - Transport Browser for BI Objects. Corresponding program is called RSAWBN_REQ_TEST_TB and that one calls FM RSAWBN_REQ_SHOW_TB which handles all logic in the t-code. Nice thig about the t-code is that you can not only easily get to know what the objects in the transport are but also navigate to particular part of RSA1 t-code and start editing the object. This is possible via “Change” button. What is strange to me is that SAP doesn’t really mention this t-code in the documentation. 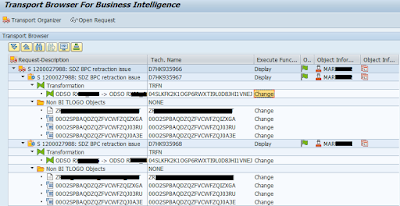 There are no mentions of the t-code what so ever in the help.sap.com neither at support.sap.com. Also the ABAP name of the t-code has a TEST in its name. Similarly development package where the ABAP program is located is marked as depreciated. So perhaps this was some SAP internal development that was never supposed to be included into final versions of BW? Who knows?